The Machinimas are films made with game engines. Video games thus become a medium for storytelling. Appeared at the beginning of our millennium, Machinimas now have their festivals dedicated and numerous digital film festivals and directing short films *have devoted a section to this art. They are designed for the young generations by their content and visual codes, because video games are a medium they know and master. It is therefore interesting to get them to use game engines for writing and directing short movies. A machinima is a film made from the recording of audiovisual sequences, produced during video game play. The workshops aim to transform an object of mass consumption and entertainment in a means of film production and expression. Depending on the venue and the type of workshop, the workshops are run by Isabelle Arvers and machnima directors. Each step of the workshop can enable everyone to fit into a creative process: writing dialogue and scenes, set design, characters, direction of virtual actors, video editing, sound mixing and put online film made on a video platform. To facilitate workshops in all circumstances, we use, most of the time, a software dedicated to the machinima design as Moviestorm or Muvizu. So even in very short workshops in duration (3 minimum hours), it is possible to conceive, shoot, edit and distribute a short film. – Discovery of machinima history, screening of film clips and explanation of technicals used for making each film. – Introduction to screenplay and dialogues writing. – Set Design and characters. – Direction of the virtual actors actions, movements, and dialogues recording. – Design of camera movements. – Editing of footage shots, sound and music integration. – Rending of film and upload on a video platform. – Public awareness on educational aspects of media: video game, image, video, sound, editing. 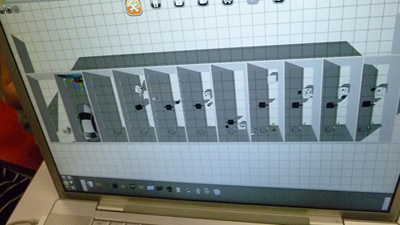 – Assimilate, integrate a tool (video game) in favor of an innovative cultural production. – Educating young people in technical writing, reading, production and editing. – Working on a playful reappropriation of the first cultural object: the video game. – Working in a group for a better perception of collective life, relationships with others. – Uniting the forces and individual potential around a common path. 31st March & 1st April 2012, all day long! 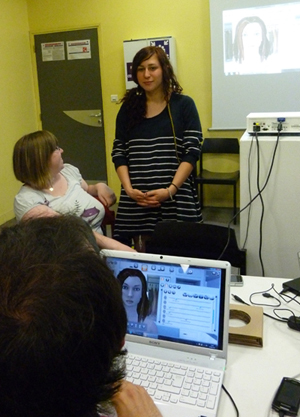 Game Camp and machinima workshop with Emmanuel Mayoud at la Maison des métallos. 24 october 2013, a workshop with thes students of ESAix, IUT of Arles and with some social and cultural mediators.